A further developers meeting was held at Martlesham over the weekend 13/14 March 2011. The main aim of the weekend was to test the downlink tlm capabilities of the ‘stack’, and in particular exercise all the functionality of the software on the CCT board. To this end we have made a couple of items specifically for testing. One of these was a mock up of the MSE experiment. This consists of 2 aluminium strips, one coloured black, and the other polished. (In the picture, the difference between these doesnt show up very well due to the lighting). Behind each strip was fixed a thermistor similar to the ones to be used in the Flight Model, and they were connected to the CCT board. We had a 1KW flood light with which we can illuminate the strips, and we hoped to be able to see the difference in rate of increase of temperature. In the event, we just ran out of time to do this. But we did manage to record the rise in temp of the test solar panels as detected by the temp sensor mounted on them. This measurement was plotted by monitoring and recording the tlm sent from the stack, via the RF and PA boards, and as received on a lap top connected to a FUNcube dongle. The other ‘new’ item was what has become known at the “Engineering GUI”. 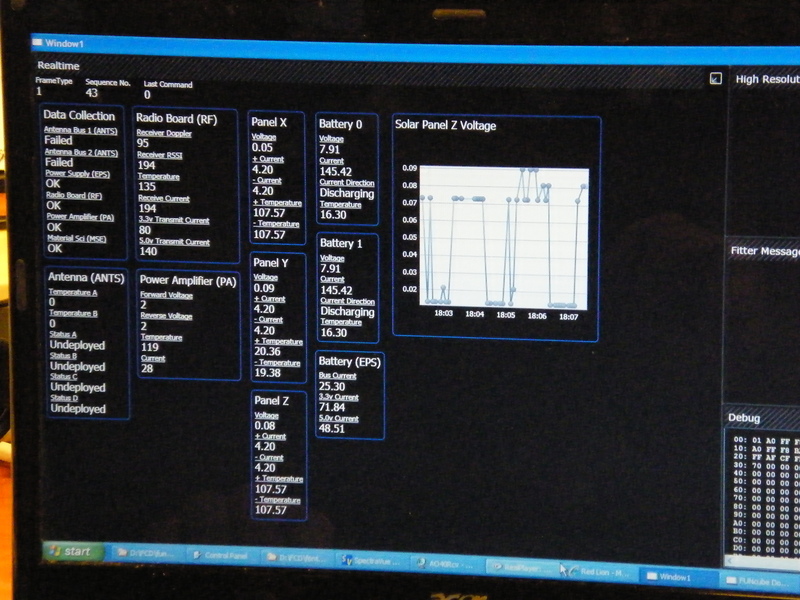 This has been written by a member of the software team, and is intended to be a simple, no frills, way of displaying the various telemetry channels. Currently this only runs on Windows, and is not yet complete. It has four display panes, one each for raw (Hexadecimal) tlm display, one for Realtime tlm, one for WOD, and one for ‘FAST’ tlm. So far only the software for the Real Time and RAW panes has been written. Nonetheless, it was an extremely useful tool for us to monitor what was happening inside the ‘stack’. During the weekend it was running on a laptop, to which was connected a FUNcube dongle. Was the meeting a success? Definitely YES. We did a lot of testing, and found several things that need ‘fixing’, but the activities at the weekend proved many aspects of our design. It is only by having these weekends, when the various ‘sub groups’ of the team bring their components together that we can do any end to end testing. But this will change, hopefully quite soon. We are planning another Face to Face meeting at our commercial partner’s premises (ISIS bv) in Delft, Holland, hopefully at the beginning of May. The aim of this meeting will be to thoroughly check out the RF and PA boards, and if things go well, we can conclude at the end of that weekend that we should now proceed to produce two Engineering Models of each. We already have two EMs of the CCT (Control) board. One is due to be delivered to the UKube team during the week beginning 11 Apr, so that they can start their own evaluation. So when we have EMs of the PA and RF boards, we can for the first time build a ‘stack’ and leave it assembled for further testing. This is likely to be done at ISIS bv. 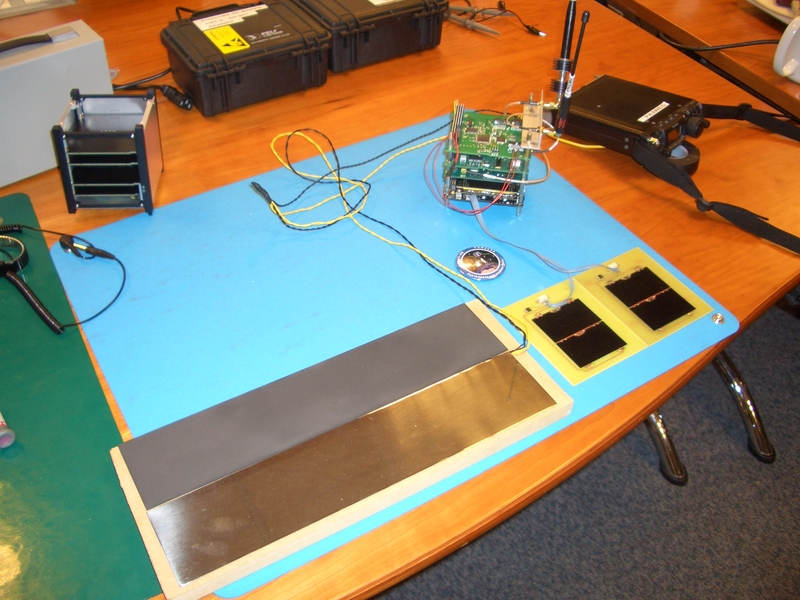 Again, one of each of the PA and RF board EMs will be delivered to the UKube team for testing and evaluation. These EMs should be completed by approx mid June.